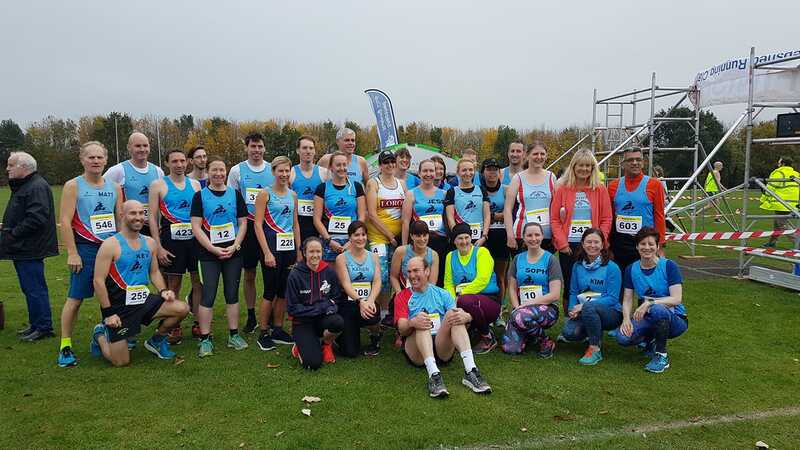 32 Ivanhoe runners represented the club at the Shepshed 7, a popular 7 mile, 2 lap course through the leafy trails and paths of the Garenden estate. Matt Pleass was first to finish of the Ivanhoe runners, in 8th place overall and an excellent 41:54, an improvement of 52 seconds from his previous best time. Alistair Burgwin scored another personal best of 43:58 to finish second for the club and 17th overall, ahead of third finisher Karl Wideman, in 26th position with 44:51. Next over the line was Ian Bolton in 45:27, followed by Andrew Stanley in 48:11. Patrick Horn attained a new PB with his 49:58, While Andrew Bottrill clocked 50:50. First Lady Home, Emily Wideman crossed the line in 51:58, in another new personal best. Kev Laz finished in 52:38, ahead of Richard Hope in 53:12. Second for the ladies, Sarah Terry clocked 53:25 followed by Andrea Trickett who crossed the line in 54:29 to gain a new PB. In Positions 168, 169 and 170 respectively but in reverse chip times as they crossed the mats, Damon Bland clocked 54:28, Chris Finney 54:26, and Matt Joyce 54:24. Martin Yeomans was next in 55:56, just ahead of Julie Taylor in 56:02. Karen Hartland made a welcome return in her blue vest with 58:09, while Mukesh Deva sportingly paced Sue Tait round to her gold standard time of 59:45. Lucy Allsop ran a substantial 6 minute personal best to clock 1:01:13, ahead of Sarah Malone in 1:04:17. Gemma Shaw finished in 1:05:38, and Jenny hope clocked 1:09:40. Jessica Southwart showed the benefits of marathon training by scoring a new personal best time of 1:09:59, followed by Mandy Morris with 1:14:07. Janet Joyce (1:18:18), Kim Harris (1:18:22), Sophie Turner (1:21:59 and Kay Gosling (1:25:47) all ran debut 7 milers at Shepshed. Julie Henfrey finished in 1:27:45, and Michelle Moore 1:31:33 to complete the team.